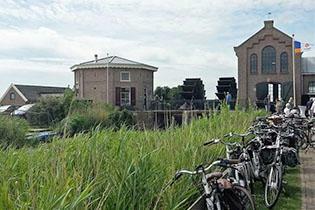 A cycling tour on small farm roads and cycling paths in a wide open polder landscape. After leaving Amersfoort behind we cycle through de Schammer en Bloeidaal, former farmland given back to nature. It consists of wet grassland, reed beds and marsh land. Adrie in Cowshed Stoutenburg We will visit a cheese farm and country shop (de Kopermolen , optional activity). On the terrace they serve an excellent cup of coffee with homemade pie. After passing Huis Hoevelaken (The Hoevelaken Estate) we cycle on small farm roads and cycle paths towards Nijkerk. In the 18th century Nijkerk was a flourishing merchant city. Many buildings in the historic centre date from this period. We continue our journey along the Arkervaart (canal) and reach the Nijkerker Nauw (Nijkerk Narrow) part of the former Zuiderzee. 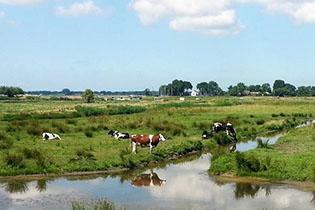 The water separates the young Flevopolder and the old Arkemheen polder. We cycle on the dike where we see the Flevopolder drained between 1950 and 1968 across the water. 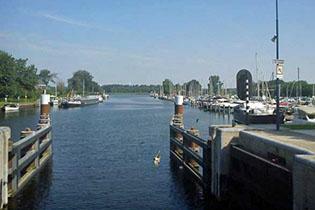 The Arkemheen polder is one of the oldest Dutch polders, dating from the 14th century. The Hertog Reijnout (optional visit) steam powered pumping-station with its two outer waterwheels drained this polder for 100 years, until 1983. Nowadays an electric facility regulates the water level. However, in extreme circumstances the old steam powered pumping station is still used. The Arkemheen polder is characterized by picturesque views of beautiful meadows, meandering brooks, old farms, dikes, rare plants and grazing cattle. It is the perfect breeding ground for a wide variety of birds. 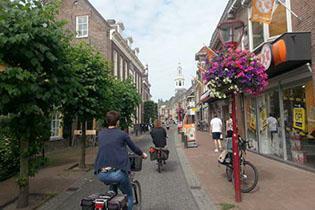 Excellent cycle paths through modern Amersfoort take us back to the city centre.